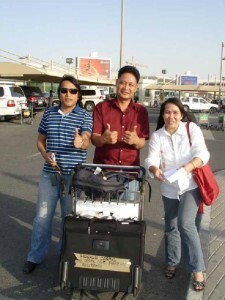 Franklin Corpuz, a deaf chef from Baguio City, beams with friends on his arrival in Doha Qatar, after being shabbily barred from boarding his flight by a Bureau of Immigrations (BI) Officer last October 5, 2011. Now on deck for his rigid training for Chefs at the One Landmark Mall in this country, his wife, Racquel Corpus, President of the Philippine Federation of the Deaf (PFD) said they laud the outpouring support of many sympathy groups including the media, which closely covered and monitored the incident. MCCID Training Director Jojo Esposa, who was Franklinâ€™s interpreter at the ABS-CBN interview the day after, said the couple was also grateful for the prompt intervention of the National Council on Disability Affairs. In a letter to BI Officer-in-Charge Atty. Ronaldo Ledesma dated October 4, 2010, OIC Mateo A. Lee, Jr., requested a quick investigation and report as basis for any legal action. NCDA, whose creation anchors on the â€UN-Convention on the Rights of Persons with Disabilities (UN-CRPD)â€, is on a constant watch for violators of the rights of persons with disabilities. In support, the training organizers extended Franklinâ€™s stay from a week till the end of the month in Qatar. Mr. Corpuz works as a Chef in Hotel Venice and Sushine Bakery in Baguio City. Contrary to the BI Officerâ€™s charge that he was leaving to work in Qatar, he was dead earnest in joining a brief training course for Chefs, as his documents indicated. At this writing, with the unrelenting denial of the erring BI Officer, Franklin and Racquel are seriously considering pursuing the case, to protect fellow PWDs from similar future acts of discrimination. The story above is shocking but nothing compared to the human rights violations that tourists and investors receive at the hands of Philippine Immigration, the conditions in Bicutan detention center represent the worst human rights violations of any country in the 21st century. Visit bicutandetention.wordpress.com for the full story.